I’m currently reading four books at once and composing just as many blog posts in my head. My golden rule of blogging is when the words flow, ride that wave. But if writing ever feels forced, it is time to take a step back and regroup. Owning the occasional frustrations of the writing process can be just as important as what is eventually said. The right words will come along. They always do. Isn’t that why God created coffee?! Here’s a photo of a cute Guinea pig to tide us over until May. I first fell in love with memoir as a junior in high school during a course aptly titled Rewriting A Life. There, I was introduced to the work of Mary Karr, and to this day I soak up her words like a sponge absorbs a misplaced glass of cabernet: fully, and scattering droplets where they are most needed (the only clean part of the carpet, for example). When you’ve been hurt enough as a kid (maybe at any age), it’s like you have a trick knee. Most of your life, you can function like an adult, but add in the right portions of sleeplessness and stress and grief, and the hurt, defeated self can bloom into place. That’s sort of how I feel lately. The perfect storm of life stressors- past, present, and future- has left me questioning my moral successes and failures, my worthiness as an advocate, and where to go from here. The answer is that there is no black or white response- only more questions, and more places to go. The best work I can do at the moment is simply to voice this. I am angry that our fellow people with diabetes are dying because insulin is inaccessible and ludicrously expensive. I am angry that the people who can afford insulin- myself included- are under the constant pressure of maintaining positive disease outcomes with rusty toolboxes. I am angry that we do not have a cure. I am angry that we are so fragmented as a community, that when we voice dissent we are quickly hushed by the status quo of comfortableness and the diabetes industry- luxuries that so many others do not have. Finally, I am angry that I am angry, that I have scapegoated much of my anger on diabetes, and that I have not always handled life’s difficulties with the grace and dignity that I know dwell within my heart. However, I am grateful that despite the bad stuff, there are friends and supporters who still believe in the good stuff. Their love has never wavered, and has inflated into a life raft when needed most. (Thank you). Rewriting A Life does not mean you get to copy and paste a Cinderella ending to your story. You simply get to live it, and to describe the good and the bad in detail that has the potential to resonate with someone else who desperately needs to hear you. Perhaps you desperately need to be heard, too. Recently, emotional and physical health have felt like running on the hamster wheel while nursing a sprained ankle and a hangover. 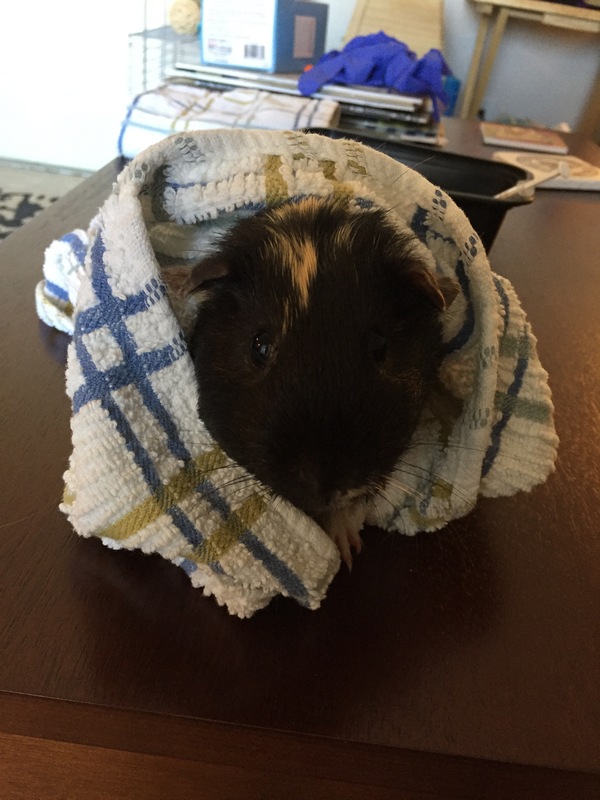 So, I switched things up and adopted a guinea pig. This is Reese. She is colored like a Reese’s cup. She is currently petrified of me, but I hope the same thing that I hope for you, or me, or any living creature: that she feels loved nonetheless.